Easily get started with Focusky! A new empty project is good for presentation designing and ideas expressing. Your project will be in perfect customized style. Focusky enables you to create an empty project with few clicks. Click "New Empty Project" to design your content layout and background color, then edit your content, only few clicks you can create a wonderful project, quite convenient! Watch the video tutorial below to learn how to create a new project. 1 Run Focusky, click "New Empty Project" to start. 2 Select empty project or layout for project. 3 Select a suitable background color. 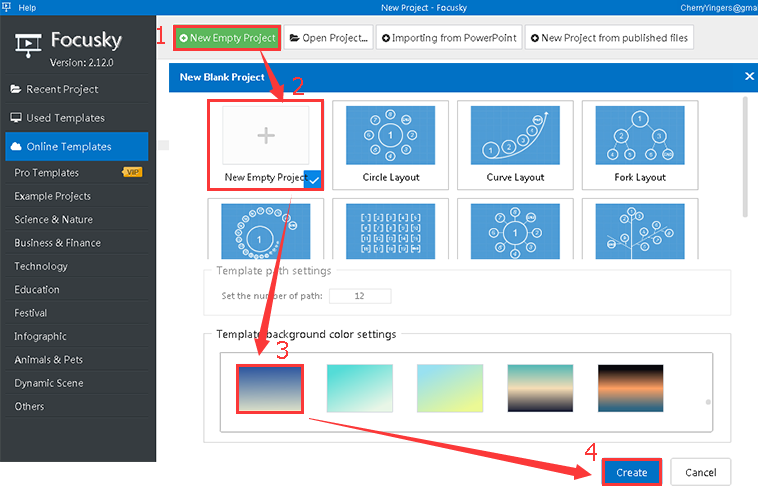 4 Click "Create" button to continue editing your project. How to import contents from PowerPoint document? How to create new project from PPT?